Every patient is unique and each case is different. Dr. Larrabee will go over your customized treatment plan during your complimentary consultation. Rest assured, our high-tech braces help make sure your treatment goes as fast as possible. See our blog for more information. Some patients experience mild discomfort after the initial bonding appointment. When wires are adjusted, patients may also experience some tenderness or soreness. Dr. Larrabee recommends patients simply take over-the-counter Tylenol as needed or do warm salt-water rinses to minimize discomfort. Will braces interfere with my school activities like sports or playing an instrument? No, they shouldn’t. It may take a few days to get used to the braces, but our patients are usually able to continue participating in sports and playing their musical instruments during treatment with no problem. 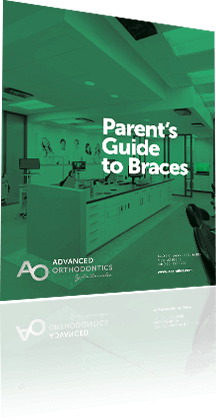 You can find answers to other common questions in our teen guide to braces. At what age should a child see an orthodontist? Dr. Larrabee and the American Association of Orthodontics recommend children are seen by an orthodontist at age seven. When your child visits our office, we will take baseline records. Dr. Larrabee will monitor their growth and development to make sure teeth are coming in right and bones are forming correctly. There is never a charge for these visits. Do I need a referral from my general dentist to make an appointment? No, you never need a referral to see Dr. Larrabee. Click here for more information on scheduling your complimentary consultation. How much do braces cost? Are there financing options available? Every treatment plan is customized to meet the patient’s individual needs. Because each case is custom, the cost of treatment varies from patient to patient. We offer in-house payment plans with no interest. Our treatment coordinator will help find a comfortable payment plan that works with your family’s budget. Can I wear braces even though I have crowns and/or missing teeth? Yes, absolutely! You can even do Invisalign if that is something that works better for you lifestyle. Do you have non-metal treatment options? We offer Invisalign as a metal-free option. Invisalign is a series of clear trays which move your teeth. Click here for more information. We also offer clear braces for patients who want to keep treatment discrete. How long will I have to wear retainers after treatment? Retainers are really for life, you simply wear them less and less as time passes. Dr. Larrabee will make sure that you get the right type of retainer prescribed for your individual smile and let you know how often to wear them. Still have questions? Learn more about retainers after orthodontic treatment.